Rwanda's Development Model - Could It Work for Sudan? Ardamata / El Geneina — Political parties and forces, civil society organisations, and armed movements have strongly condemned the massacre of Ardamata camp in West Darfur, which claimed the lives of six people. As previously reported by Radio Dabanga, on Wednesday, gunmen attacked six displaced people from Ardamata camp who were collecting straw at Arafa, east of El Geneina Airport. The attackers were blocked in their attempt to rob the displaced people of their donkey carts. The cart owners confronted the gunmen and killed three of them, while wounding two others. The gunmen injured two of the cart owners. The incident sparked large-scale protests in the town. Realities are not convenient for such a decision, Prof Reeves asserts. Security Council resolution 2429(2018) has obliged the mission to exit and move to its new headquarters in Zalingei, Central Darfur, and to distribute some assets to institutions. Political parties and forces, civil society organisations, and armed movements have called for an independent investigation to bring those involved in the incident to justice, as well as calling on human rights organisations and victims of war to apply pressure for the protection of unarmed civilians. In a statement on Friday, the opposition National Umma Party (NUP) termed the massacre "the completion of the hateful criminal approach of the regime, which has committed crimes against humanity and genocide in Darfur". The NUP statement stressed that "the hour of retribution and accountability is inevitably coming". The opposition Sudanese Congress Party believes that "the protection of the country from the bloody regime of Khartoum would only be by overthrowing it through daily peaceful demonstration." It called on everyone in Sudan to promote the peaceful revolution, and the continuation of the peaceful resistance until the announcement of the overthrow of the regime. 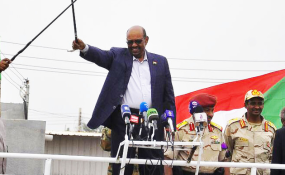 The Sudan People's Liberation Movement-North (SPLM-N) armed movement described what has happened as "the regime's ongoing systematic oppression against the Sudanese people through the shedding of blood and intimidating the safe people". The Darfur Media and Journalists Association held the government responsible and demanded an investigation to bring those involved in the incident to justice.